Battered Haiti Braces For Possible Hurricane Hit Tropical Storm Tomas is expected to reach hurricane force by the time it reaches the Caribbean nation early Friday. The government has urged more than a million residents still homeless after this year's massive earthquake to evacuate emergency camps. But few have anywhere else to go. Haiti was girding for the arrival of a storm expected to swirl to hurricane force by the time it hits the Caribbean nation, still reeling from a devastating earthquake and recent cholera outbreak. Tomas, now a tropical storm, was closing in on Port-au-Prince. Experts say its impact will be felt island-wide and could cause heavy flooding in some areas — particularly the western reaches of Haiti's southern peninsula. 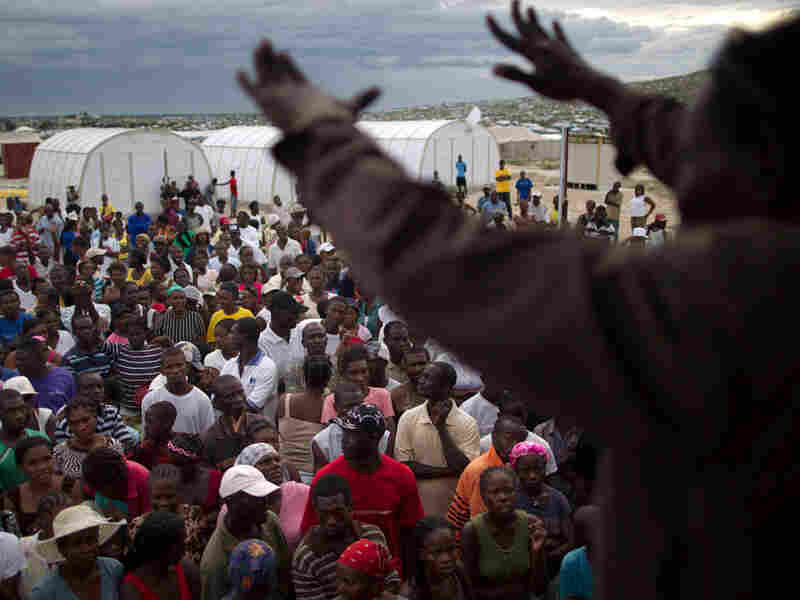 An earthquake survivor explains to fellow refugees why they need to evacuate the Corail-Cesselesse refugee camp in Port-au-Prince to seek shelter before Tomas' arrival. The storm killed at least 14 people when it battered the eastern Caribbean island of St. Lucia as a hurricane on Saturday. 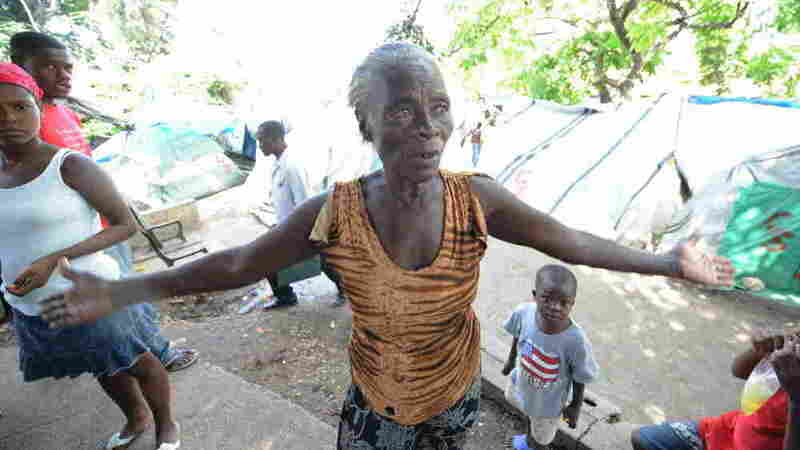 Haiti's government has urged the more than 1 million people still homeless after the January quake to evacuate emergency camps. Radio announcements blared warnings that those living in tent cities or makeshift shelters should ride out the storm with friends or family. As the skies darkened over Port-au-Prince and roof tarps started flapping in the wind Thursday morning, a policeman at the Corail-Cesselesse camp shouted through a megaphone: "The hurricane is not a joke! ... You need to get out of here!" Across the Haitian capital, some people were securing tarps over their shacks or gathering together their important documents, but most people had nowhere to go. Officials said there were more than 1,000 shelters available, though that number includes any structure expected to stand up to high winds. The U.N. Office for the Coordination of Humanitarian Affairs said there is a need to identify safe public infrastructure for use as potential havens. "We are using radio stations to announce to people that if they don't have a place to go, but they have friends and families, they should move into a place that is secure," said civil protection official Nadia Lochard, who oversees the department that includes the capital. Matthew Cochrane, spokesman for the International Federation of the Red Cross in Port-au-Prince, said volunteers had fanned out there and in the southern cities of Jacmel and Leogane telling people to seek shelter. Fear and confusion have plagued many of the earthquake survivor camps. Tensions boiled over into scuffles Wednesday at Corail when managers tried to explain a planned voluntary evacuation of nearly 8,000 people from ShelterBox tents — once promised to be hurricane-resistant. Some people marched through the rows of white tents demanding to be moved. Others said they wouldn't leave unless someone promised them that they'd be fed and in a secure building. There's an understandable frustration that this comes on top of an earthquake and, for many communities too, on top of a serious fear of cholera. "The entire camp, I believe, is vulnerable because it's located on a flood plain, and it's out here in the open just on the bottom of this hill," Bryant Castro of the American Refugee Committee told NPR's Jason Beaubien. "If it was up to me, and I've told the IDPs [internally displaced persons], everyone should go." Originally he'd announced that the camp would be evacuated, but then Castro was informed Wednesday night that there was only shelter space for 1,800 of the 6,500 residents. 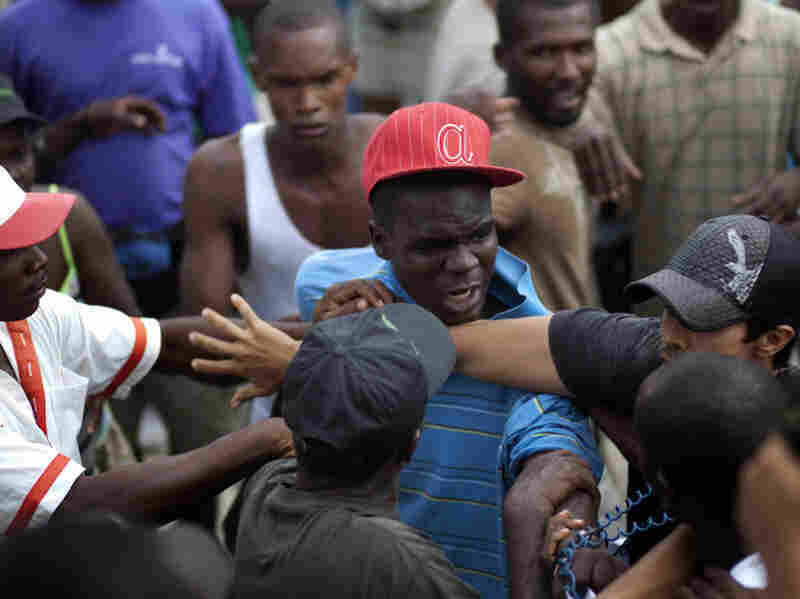 Castro said political groups have been causing disturbances in the camp, and the Haitian government hasn't provided enough police for an orderly evacuation. Castro said he was simply going to do what he could before the storm hits. The tentative plan there, as at several other camps, was to move some people to schools, churches and other structures, such as abandoned prisons. Tomas is expected to "flood rivers, flood latrines and sewage systems [and] ... definitely contribute to the spreading" of cholera, Cochrane told NPR by telephone from the Haitian capital. He said the Red Cross had pre-positioned aid — including caches of clean drinking water — in advance of the storm in hopes of being able to deliver supplies quickly once it passes. Even as Tomas aims at Haiti, residents were already reeling from the effects of blow after blow to the impoverished nation. The Jan. 12 earthquake killed an estimated 230,000 people and destroyed infrastructure, and the recent cholera epidemic has killed more than 400 and made thousands ill.
"There's an understandable frustration that this comes on top of an earthquake and, for many communities too, on top of a serious fear of cholera," Cochrane said. Still, he noted that one of the "small mercies" of the magnitude-7 quake is that the international aid community is already in place for this latest crisis. "There is a large and quite strong humanitarian presence here," Cochrane said, adding that the Red Cross alone has been distributing more than 650,000 gallons of fresh water a day just in Port-au-Prince. Disaster officials have extended a red alert, their highest storm warning, to all regions of the country. While Tomas' center is expected to stay just offshore, its wrath likely will be felt along the west coast of the island of Hispaniola, which Haiti shares with the Dominican Republic, through storm-vulnerable Gonaives and Haiti's second-largest city, Cap-Haitien. The U.S. National Hurricane Center in Miami announced a hurricane warning Thursday for Haiti and the southeastern Bahamas and Turks and Caicos. A tropical storm warning was issued for Jamaica, along with tropical storm watches for the southern coast of the Dominican Republic and eastern Cuba. As of 2 p.m. Thursday afternoon, Tomas was about 295 miles west-southwest of Port-au-Prince, and about 118 miles south-southeast of Kingston, Jamaica. The storm had maximum sustained winds of 50 mph and was moving north-northwest at 7 mph.